Many suffixes we use in English originally come from Greek or Latin word endings. 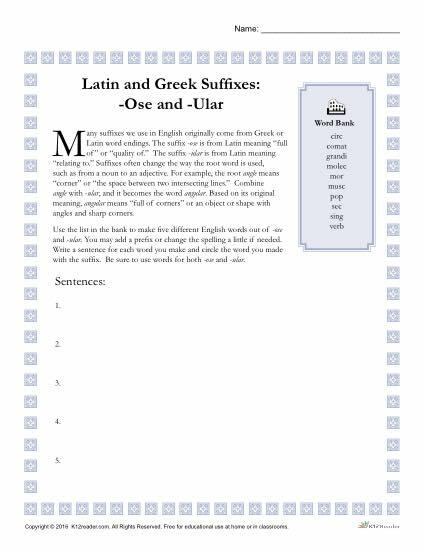 The suffix -ose comes from Latin meaning “full of” or “quality of.” The suffix -ular comes from Latin meaning “relating to.” In this worksheet, students will use each of these suffixes to create five different English words out of those given in the word bank. After writing five original sentences using the words they have made, students will be asked to circle the word made with the suffix. This is great practice for learning how to use and identify Greek and Latin suffixes! © 2008–2018 | k12reader.com | All Rights Reserved. Free, Printable Reading Worksheets, Lessons and Activities for Classroom use and Home Schooling.